Amazing 360° videos of Puerto Mogan! "It's as if you were here!" Data is logged at two minute intervals, but is recorded every minute. Use your browser\'s reload/refresh facility to retrieve the latest data. Strikes detected during the past hour by our lightning detector sited near Mogan are indicated by small red '+' signs along with the date and time they occurred. Lightning detection equipment and image provided by TOA Systems. MeteoSat image on West Cheshire College\'s website. A short animated sequence of satellite images shows the movement of the clouds around the Canary Islands and the African coast on Sat24.com. If you watch at the right time you can view the progress of dawn and dusk across the region. There are also weather forecasts, sea conditions, surface pressure charts, ship's weather observations, satellite images etc. of the area available on this page. 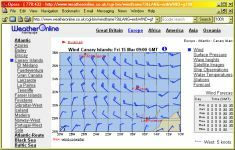 www.weatheronline.co.uk has weather information for both at sea and inland all over the world. Available in English, Dutch, German and Chinese. EasyTide Tidal Prediction Service provides tidal predictions for over 6,000 ports worldwide. It's simple to search for and bookmark the location you want for direct access to the latest update. The Naval Atlantic Meteorology And Oceanography Center has information about tropical cyclones, aviation weather, east coast of United States, the Caribbean, Greenland, Norwegian and Barents Sea, the North and South Atlantic, long range forecasts and climatology.